The content was based on many years of writing papers and making presentations at e.g. the ICONE. ASME (American Society of Mechanical Engineers) announced a monograph on their congress in Houston November 13th–19th, 2015, that summarises state-of–the-art knowledge for Finite Element Analysis, in a planned series for Nuclear Engineering and Technology. A monograph is a one-time summary of the state-of-the-art knowledge on some specific scientific subject, aimed for professional engineers, in this case. Dr. Lingfu Zeng, Lennart Jansson (ÅF) and prof. emeritus Nils-Erik Wiberg (Chalmers University of Technology) are authors of the first monograph. The content was based on many years of writing papers and making presentations at e.g. the International Conference on Nuclear Engineering, ICONE. 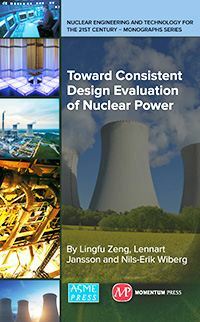 Toward Consistent Design Evaluation of Nuclear Power Piping by Nonlinear Finite Element Analysisby Lingfu Zeng, Lennart Jansson and Nils-Erik Wiberg is part of the Nuclear Engineering and Technology for the 21st Century Monograph Series. This 80-page book addresses several issues that are essential for achieving a consistent design-by-analysis in accordance with the ASME Boiler and Pressure Vessel Code, including nonlinear alternative rules, fatigue, thermal ratcheting, dynamic loads, strain-based criteria, nonlinear finite element procedures, supports under combined stresses, among others. Unlike other publications on piping, this monograph is focused on commercial software and current practices for power uprate and life extension of aging nuclear power facilities.